WASHINGTON — President Donald Trump’s homeland security adviser said Monday that the malware that has infected 300,000 computers in 150 countries is “in the wild,” but so far has not infiltrated U.S. government systems. Tom Bossert, assistant to the president for homeland security and counterterrorism, said three variants of the malware have been discovered and the U.S. government was closely monitoring the situation with officials in Britain. Computers across the world were locked up Friday and users’ files held for ransom when dozens of countries were hit in a cyber-extortion attack that targeted hospitals, companies and government agencies. Cybersecurity experts say the unknown hackers who launched the “ransomware” attacks used a hole in Microsoft software that was discovered by the National Security Agency and exposed when NSA documents were leaked online. The Department of Homeland Security is taking the lead on the investigation in the United States. The Cyber Threat Intelligence Integration Center is keeping the U.S. government informed about classified information concerning the investigation, he said. Neither the FBI or NSA would comment Monday. 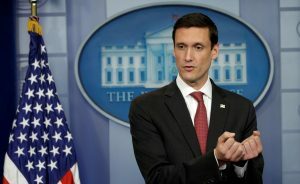 Left: Homeland Security Advisor Tom Bossert announces May 11 that Trump signed an executive order to bolster the government's cyber security and protect the nation's critical infrastructure from cyber attacks, during a news briefing at the White House in Washington, D.C. Photo by REUTERS/Kevin Lamarque .